Whether you’re an Etsy seller or you sell independently, it pays to use social media and any other free marketing methods at your disposal. Because that’s exactly what social media is, it is a free marketing tool. And one that can boost your business. However it’s important to be strategic about and use social networking in a way that helps with your goals. If you wish to get more leads for your email list, then devise a plan to do just that. If you’re goal is to get more social media shares on your blog or on your website then create a goal for that. In this article we will focus on Pinterest, since this network is uber popular with women and as such is a great place to promote anything female friendly. 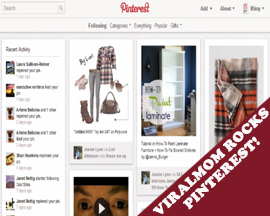 Below we highlight how you can use Pinterest to promote your web shop. The tips apply to any mom in any niche. One of the best things you can do on Pinterest or any social account is to network with others in your niche. This is one of the best ways to not only get more followers, but more clicks, links and in this case – more pins. Networking consists of commenting on other pins, replying to those who comment on your photos and quotes, and generally seeking out others to talk to and share with. The more you network, the better your chances of having a successful profile and in turn – more leads for your small business. Many underestimate the importance and value of networking on Pinterest, but this truly is key for growth and prominence with your profile. Doesn’t matter what type of business you run, surely there’s a product, a service line or maybe just an employee that you can showcase via a Pinterest board. Make them your “star” and let everyone know how awesome they are and also what is uniquely special or fun about them. Maybe you run a handmade soap business, and one of your most popular items is the minty choco choco bar that everyone raves about. If so, this would be a prime candidate to showcase on a Pinterest board and what you would want to do is maybe create a board all about chocolate. Essentially find a way to tie your product into a fun and wacky board. You might have seen this already by the big brand names, so now it is your turn to try the same. The way this works is that you create a board where your customers get to submit pins and the incentive to do so is that it’s a giveaway board. You make this board a giveaway and motivate others to PIN photos, quotes and or videos. Photos and quotes tend to do best. This could be a monthly, bi weekly or even a daily flash giveaway and an awesome opportunity to engage your base but also generate leads for your company. Try one or all three of my tips above and then come back here and let us know who you networked with on Pinterest. You can start by adding me and networking with me, I will then add you as well. Make a plan to add at least five others to your profile and network with them as well. Good luck. Who are the five that you’re going to add and network with this week on Pinterest? Tell us below. When you have a shop like fashion or shows you can easily promote that with pinterest. It was meant to be for the product pinning. Anyway, right now there are many categories of pins in the pinterest. A single board can gain you huge fame.